I have always had a fascination for wide-leg pants. When I was 14 years old, my friend and I were crazy about wide-leg pants. We usually dressed up in wide-leg pants and crop tops while choreographing our favorite songs like "There You Go" by Pink and "Wannabe" by Spice girls--great memories! Fast forward to 2011, I am still in love with wide-leg pants, bell-bottoms, and now, I just can't get enough of these palazzo pants. I love the color and silhouette--great for spring/summer weather. You look great! I love the bus stop pic. You look freaking great. I want those pants. I was obsessed with my friends fatigue wide leg pants when I was in junior high. I borrowed them from her and never wanted to give them back!! Nice! I'm especially digging the unique necklace. Check out my work blog too! Love this look to pieces, that blue looks so good on you. You have a way with color. Love it all. The pants, the clutch, the necklace, great pieces. Love the colors you look awesome! You look fantastic!!! I love these pics! 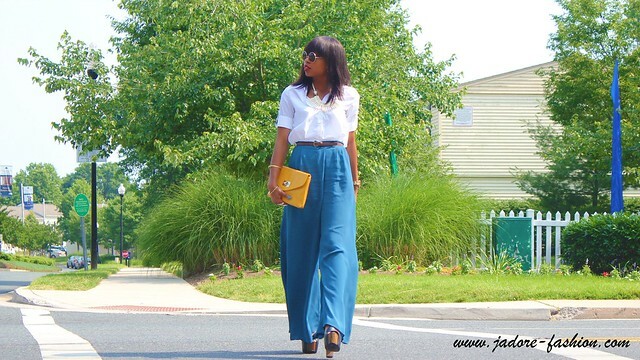 Wide leg pants are amazing!!! I LOVE them! amazing pants in your lasts two posts! Your outfit is perfection! I adore all the colours together, you are so stylish!! You look Fantastic!! Wide legs look really really good on you! I love these on you! 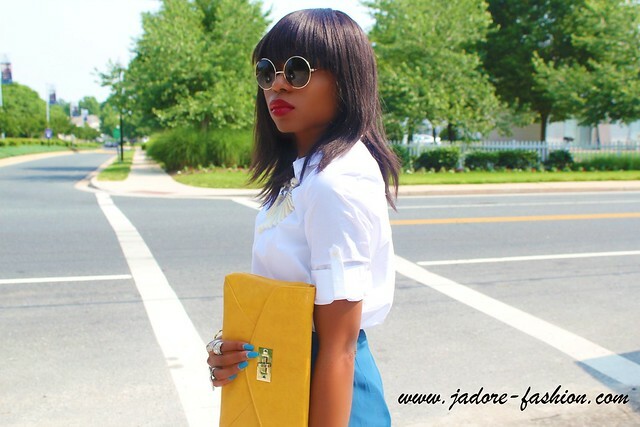 and that is such a great clutch! I adore the entire outfit!! !Your pants are absolutely amazing!!! Those pants look great on you. They were just hideous on me and went back immediatly.